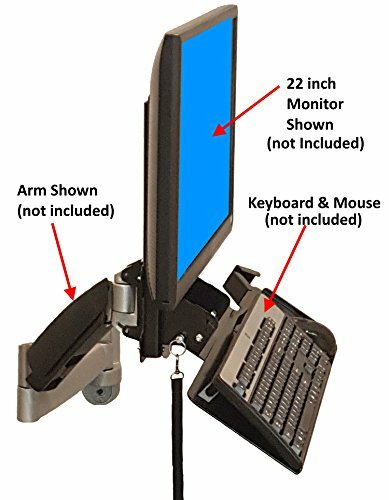 SDS iMount 4.0 Keyboard & Monitor Wall Mount w/ Tilt, Fold Away Adjustable Tray System 7x18 Tray + Mouse Ext. (Mounts Directly To The Wall) Manufactured in Michigan by SDS at Momiji Studios. MPN: ATT02+MOUSE. Hurry! Limited time offer. Offer valid only while supplies last. 100% manufactured in the USA. Made in Michigan! Simply the best wall mounted workstation ever! Tilting and Folding Keyboard Tray one hand operation. 100% manufactured in the USA. Made in Michigan! Simply the best wall mounted workstation ever! Tilting and Folding Keyboard Tray one hand operation. VESA style mounting for a monitor. Fasten the quick wall mount to a stud in the wall, then connect the monitor to the bracket and slide the bracket into the quick wall mount. (its that easy) The tilt feature has 3 locking positions, flat, 30 deg. down and fold up Eco-friendly black Powder Coating for long lasting finish. Keyboard tray when folded up only stick out from the wall 4 inches. Keyboard tray makes a wonderful Kiosk. Keyboard tray has a very small foot print, great for tight spaces. Keyboard trays and stands are great for use in warehouses, dentist office, hotel lobbies, libraries or any government office. Kiosk in restaurants, airports etc. Important Note: Mounting to Dell all-in-ones may require some modifications to the keyboard tray.